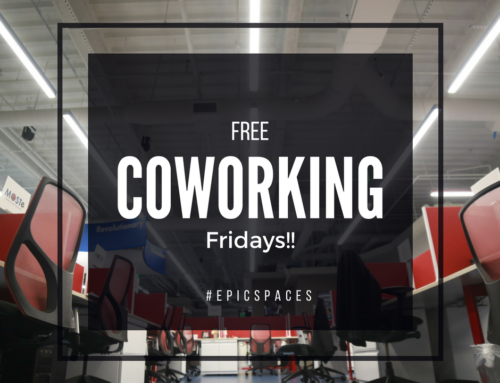 Join us Wednesday 7/12 for “Morning Connection”, EpicSpaces’ newest networking event series. As always, coffee will be provided by our favorite, Coast2Coast Roasters! 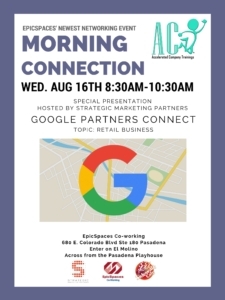 This week: Strategic Marketing Partners will be hosting Google Partners Connect: Retail Business! This Wednesday’s event is about how digital marketing can help you thrive on the Web. Speakers and panelists have been selected for their proven expertise in digital advertising and marketing. **Alex Chen**Alex will speak about the power of Google Shopping and provide recommendations Partners and advertisers can implement together in AdWords. **Gable Tax Service**Specialists from Gable Tax Service will discuss what they do for retail businesses. In an effort to better support our community of entrepreneurs, Accelerated Company Trainings has created “Morning Connection”!!! This is a fun and dynamic weekly meetup where professionals can gather to get to know each other, find creative business solutions, learn from expert speakers on a wide array of business topics, and have an opportunity to both think and act out of the box.